아프리카 수면병(영어: African trypanosomiasis, sleeping sickness)은 사람과 다른 짐승에게 발생하는 기생병이다. 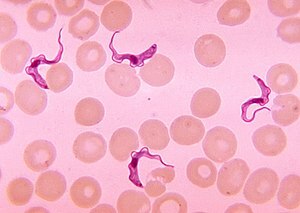 파동편모충(Trypanosoma brucei) 종의 원생동물에 의해 발생한다. 사람을 감염시키는 종류로는 두 가지가 있는데, 감비아파동편모충(Trypanosoma brucei gambiense, T.b.g)과 로데시아파동편모충(Trypanosoma brucei rhodesiense, T.b.r. )이 그것이다. 감비아파동편모충의 경우 보고된 사례 중 98%가 넘는다. 둘 다 일반적으로 감염된 체체파리의 물림에 의해 전파되며 농촌 지역에서 가장 흔하다. ↑ 가 나 다 라 WHO Media centre (March 2014). “Fact sheet N°259: Trypanosomiasis, Human African (sleeping sickness)”. 《세계보건기구》. 2014년 4월 25일에 확인함. “Sleeping sickness”. Médecins Sans Frontières. 2013년 10월 23일에 원본 문서에서 보존된 문서. 2013년 5월 15일에 확인함. Links to pictures of Sleeping Sickness (Hardin MD/ University of Iowa) archived 2006-02-19. Hale Carpenter, G.D. (1920). 《A Naturalist on Lake Victoria, with an Account of Sleeping Sickness and the Tse-tse Fly》. Unwin. OCLC 2649363.